Rooms (B & B) are available between March 15th and November 1st and can be booked for one or several nights. Also the Gîtes can be booked during all seasons for a period of one or several weeks. From Paris take the A6 in the direction Auxerre. From Auxerre take the N6 to Avallon and then drive via Lormes to Ouroux en Morvan. When you arrive at the village, pass the church and continue along the main street until the house with the brown panels (immediately after the Pharmacie) on your right hand side. 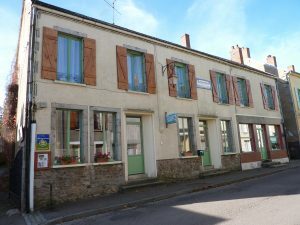 Please turn right into the entrance between this house and the Post office: Welcome at Ambiance Morvan!